Nandi Person (‘16, ‘18) lived in St. Louis her entire life. She went to Hazelwood Central High before going on to pursue a criminal justice degree and an MBA at MBU. 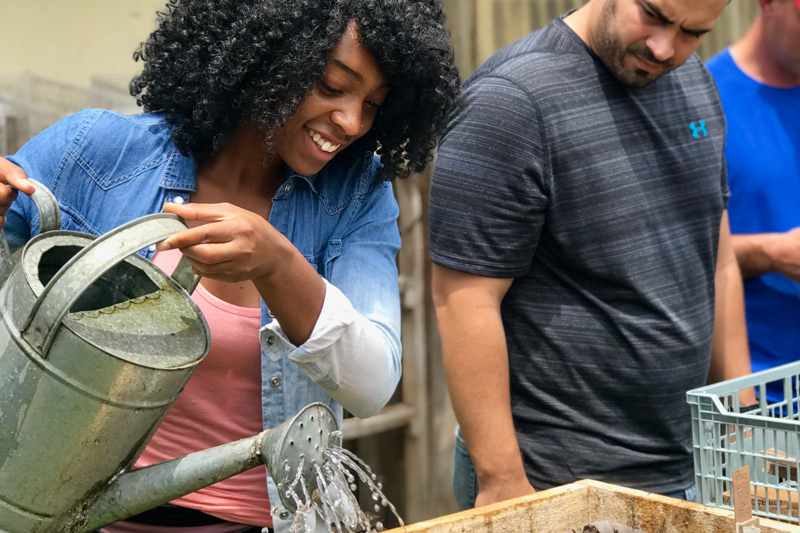 Despite a longing to travel or study abroad, she never got the chance to go beyond the United States borders—until she decided to dive in to a two-year long commitment to the Peace Corps as a volunteer in Costa Rica this summer. Going to school at MBU, Person credits professors and administrators such as Dr. James Kellogg, Brenda Bradford and Dr. Alton Lacey for sparking an interest to pursue work internationally in her career. Knowing she wanted to work internationally in some capacity upon graduating, a Google search for opportunities abroad in one of her last semesters at MBU led her to the Peace Corps website—a volunteer service program funded by the United States, which aims to provide opportunities to become servants and changemakers in a community abroad—and Person felt drawn to apply. Months later, she found out she got accepted and would be moving to Limon, Costa Rica, in July 2018. Person is sworn in as an official Peace Corps volunteer. Upon arrival, Person joined her new cohort of 21 people to participate in the Peace Corp’s extensive training session that would last for about three months. She spent a lot of that time learning Spanish in order to communicate and connect with the people there. Person admitted it was a struggle to get to the required “intermediate-high” level of proficiency in order to get sworn in as an official Peace Corp volunteer. 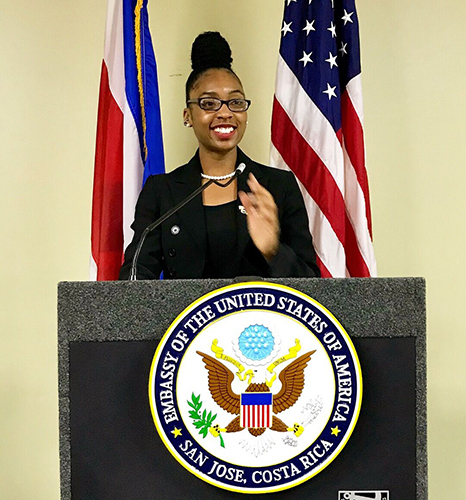 Two weeks before the test she needed to pass in order to stay, Person was discouraged, but she persevered through her studies and passed the test the day before the swearing-in ceremony. Not only did she pass, but she more than rose to the occasion. She was asked to read a speech that she was required to write to become part of the Peace Corps. The area Person is assigned to in Limon is a low-poverty community. She was excited to know she would work with youth in local schools and hopes to enhance participation in community organizations. Initially, Person wondered how her passion for physical fitness would be able to be maintained in her new life abroad. She ran track and field as well as played lacrosse with MBU’s athletic teams. She even went on to develop a program called Women in Nature in St. Louis, where a group of women would gather to exercise as well as pray together. 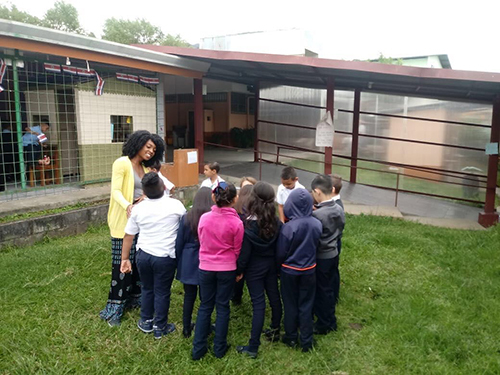 Person meets with children in a local school in Limon, Costa Rica. Now that Person is settled-in to her new home, she’s working on her new fitness routine in a third-world country—and she even documents her activity through her blog, Natural Nandi. Without a gym to go to every day, Person decided to stay active through her community involvement. Because the kids in her community love being outside and play a lot of football (soccer), she’s been developing projects for them that combine her love for fitness and her job. Worrying about her daily workout is a far cry from where Person was just 18 months ago. Her move to Costa Rica marked the first time she had traveled outside of the United States. And with no car or air conditioning in her apartment, getting use to her new life wasn’t easy. However, Person said she felt God placed her in this position and believes that sometimes you have to get uncomfortable to realize your full potential. “Do what you feel your heart is calling you to do,” Person said. Featured photo: Nandi volunteers to help the owner of Riverside, an organic restaurant with an on-site garden.